"There are strange things done in the midnight sun," poet Robert Service wrote. He was referring to the Klondike gold rush, but he could have been referring to the Arctic atmosphere, the strangeness of which continues to confound and concern scientists. The chlorine finding, published in Nature Geoscience, is simply weird — it's too early to conclude what it means for the environment on a broader scale. But the mercury finding, , is worrisome. Mercury is a potent neurotoxin that enters the atmosphere through coal-burning power plants and other industries, and can be carried far from its original source. When it enters an ecosystem, bacteria can transform it into highly toxic methylmercury and that builds up in wildlife; in humans, it has a host of harmful effects including neurological damage to babies in the womb. "There's a lot left to learn — not just about the Arctic atmosphere but about atmosphere, ocean, sea ice, land, and snow," said Kimberly Strong, an Arctic expert and atmospheric physicist at the University of Toronto who was not involved in either research team. "We're really just starting to pull together all the bits of the puzzle, and these two studies are contributing to that." "At first we thought the instruments were broken," says Alexandra Steffen, an atmospheric mercury specialist at Environment Canada who was involved in those early experiments and the new study published in Nature. "Then it happened again. So then we started to really say, ok, what is going on here?" They hauled a mercury-measuring instrument that was made in Toronto onto the frozen Chukchi Sea off the coast of Alaska, and then monitored what happened when air masses moved over channels of open water in the sea ice called "leads." The mercury and ozone were being sucked down from higher up in the atmosphere as a result of the "leads" in the sea ice. Leads expose the frigid Arctic air to warmer sea water, creating turbulence that churns the atmosphere above and draws down a fresh supply of air where the mercury and ozone have not been depleted yet. That means there is more of both available to undergo the process of being destroyed, in the case of ozone, or deposited onto the earth's surface, in the case of mercury. Climate change has radically altered Arctic sea ice dynamics, creating thinner seasonal ice that is more susceptible to the creation of leads. It's possible, the researchers conclude in Nature, that this process is increasing the overall mercury load in the Arctic. The next step is to confirm that this happens elsewhere in the Arctic, says Obrist. "But this certainly has the potential to refuel the mercury deposition and increase it. 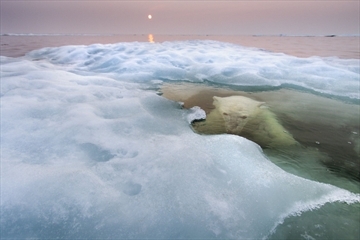 "A changing Arctic can have very unexpected consequences." The data "bordered on incredible. We didn't believe it at first," says Huey. Chlorine is not only highly reactive, but highly reactive with sunlight, and the levels were measured during the day. It's unclear where such a massive supply of chlorine is coming from, though likely its original source is sea salt. Chlorine, like bromine, reacts with mercury, oxidizing it and depositing it on earth. It also destroys ozone and methane. Huey has just finished writing a proposal to study whether chlorine appears in the atmosphere in other parts of the Arctic. It's too early to say how chlorine may be affecting the mercury cycle in the north. "The Arctic is a rich and wonderful place, and I hope we make our way to learn what's going on and preserve it as best we can."